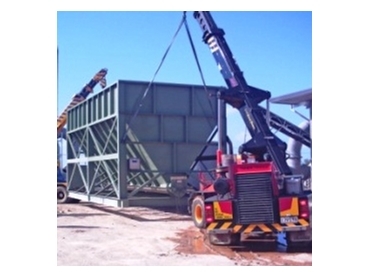 Industrial weighing equipment designed for the weighing of treated by-products was recently fitted to a large hopper at Gold Coast Water’s Pimpama plant by Accuweigh . This industrial weighing equipment plays an important part in the treatment process by tracking the volumes of waste product generated by the plant and also ensuring the trucks removing the waste do not exceed legal weight limits on public roads. Sludge is fed into the 120T capacity industrial hopper scales by dual conveyors and an auger/conveyor combination empties the sludge from the hopper scale into waiting trucks. The sludge is then delivered free of charge to local market gardeners for soil rejuvenation applications. The industrial weighing equipment was supplied and installed by Accuweigh’s QWM branch in Brisbane to a hopper measuring 10m L x 4m W x 5m H with a holding capacity of 120 tonnes. Accuweigh is a major industrial weighing systems provider in Australia with branches in all mainland states that have successfully completed hundreds of industrial weighing equipment installations across Australia.